Smart Reader® Worldwide continues its noble efforts to advocate equal access to quality early childhood education through the presentation of the National One Child One Hope (OCOH) Education Scholarships to fourteen underprivileged children from Yayasan Tuanku Syed Putra. 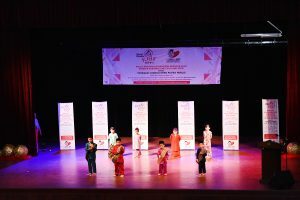 The event took place on 21st March 2019 at Auditorium Kompleks Kebudayaan Negeri Perlis, Kangar. 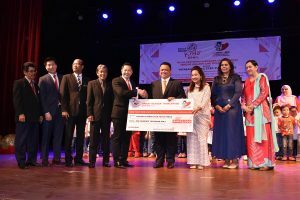 During the event, Chief Executive Officer of Smart Reader® Worldwide, Dato’ SriDr Richard Ong, presented a cheque worth RM100, 000 to DYTM Tuanku Syed Faizuddin Putra Ibni Tuanku Syed Sirajuddin Jamalullail, Raja Muda Perlis who is also the Chairman of Yayasan Tuanku Syed Putra. 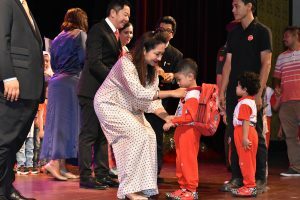 The contribution composed of financial aid in terms of schooling fees as well as school supplies, and were distributed by Raja Puan Muda Perlis, DYTM Tuanku Hajjah Lailatul Shahreen Dato’ Akashah Khalil as the Royal Patron of the Association of Professional Early Childhood Providers Malaysia (APECP). As the leading preschool education provider in Malaysia, Smart Reader® Worldwide believes that is vital for young children to be exposed with a quality educational experience. The Smart Reader Kids® international award-winning programmes provide children with a holistic experience as it enhances children’s cognitive, social and physical skills using a simple, creative and fun methodology which serves as overall perfect learning platform for children in their formative years. The integration of technology in education in recent times have been shown to play a positive role in children’s development and learning when used effectively. In line with its vision to create the best educational experience for its students, Smart Reader® Worldwide has developed tech-based applications that will not only transform the teaching and learning process, but also improve the management of the centre’s administration to better monitor students’ safety, well-being, and progress in school. Introducing the new and innovative schooling system, the Smart Kinder-Tech Programme and the Smart Student Management System. The Smart Kinder-Tech Programme enables children to enjoy stimulating and engaging lessons by utilising an interactive e-learning programme while the Smart Student Management System allows parents to access all information regarding their child, including live attendance, activities, and achievements at all times from a mobile application. Through the National One Child One Hope Education Scholarship Programme, less fortunate students are able to access similar excellent educational experience. Since its commencement, the programme has funded more than 600 underprivileged students nationwide through their preschool education. The organisation will continue this noble endeavour in Smart Reader Kids® centres nationwide to offer children scholarship assistance to underprivileged children in Malaysia.